A network topology defines the way various components communicate with each other within an IoT network. Topologies can vary greatly in security, power consumption, cost, and complexity. Before choosing and implementing a communication technology, it is important to first understand which topology is most relevant to your IoT applications and requirements. In this blog, we compare mesh vs star topology – the two most common architecture types for IoT wireless networking. In mesh networks, a message hops from one device to another in order to reach its destination (e.g. a gateway). A sensor node, serves as both an endpoint that captures and transmits their own data as well as a repeater that relays data from other nodes. 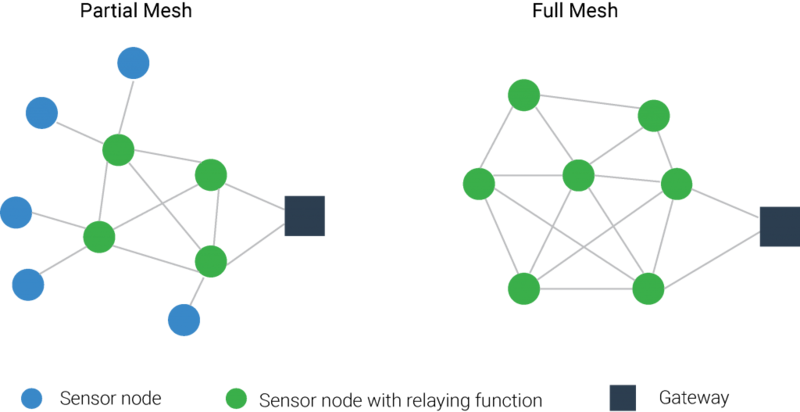 In a partial mesh network, only selected nodes have the repeater/relaying function and are connected with more than one other node, while in a full mesh network, all nodes are homogeneous and fully interconnected to each other. Mesh topology is widely employed to extend the coverage of short-range wireless technologies such as Zigbee, Z-Wave, WirelessHART. Most mesh networks have a self-healing capability as data can be re-routed using another path if one repeater node fails, thereby enhancing robustness. If enough repeaters are installed, you can cover large areas like an entire industry campus or a commercial building using mesh configuration. Nevertheless, since the range between two nodes is very short in nature, the number of required repeaters increases rapidly, making these networks very expensive to install. In many cases, extra sensor nodes must be added, not to capture data, but simply to attain the desired coverage. Redundant device density and excessive numbers of connections significantly complicate network setup, management and maintenance activities. Complexity greatly hampers scalability and despite low transmit power, the relaying nature of mesh networks imposes very high power consumption. Nodes must constantly be “awake” and “listen” to whether a message needs to be relayed. High relaying traffic through one node can also quickly drain its battery. Another major concern over mesh networks is their vulnerability to security attacks. If a single repeater is breached, the entire network collapses. The larger your IoT network, the more repeaters – or better said – the more possible points of attack. When it comes to full mesh networks where all nodes act as the repeater, you may want to think twice before installing one. An alternative approach to wireless IoT networking is star topology whereby all sensor nodes communicate to a central hub/access point (i.e. a gateway). Technical design of the central hub is much more sophisticated to handle huge amounts of data flowing to it. Thanks to one-hop, point-to-point connection, star topology is much simpler and less expensive to implement compared to mesh topology. Network security also increases, as endpoints operate independently of each other; if a node is attacked, the rest of your network still remains intact. The primary disadvantage of star topology is that the network footprint is limited to the maximum transmission range between devices and the gateway. However, choosing the right communication technology can help overcome this problem. For example, a Low-Power Wide Area Network (LPWAN) with an extensive range of over 10 km line-of-sight will enable vast coverage when deployed in star topology. LPWAN star networks are optimized for minimal power consumption and can secure years of battery life on the sensor side. Unlike mesh topology, nodes are not required to be continuously “awake” to listen and relay data from other nodes. Outside of transmission time, they can fall into “sleep mode,” consuming almost no power. So which topology is the right one for you? The answer is very simple: It all comes down to your IoT applications. For example, Zigbee, Wi-Fi or Bluetooth mesh networks can be a great option for applications in the consumer marketplace. Smart home use cases such as HVAC and lighting automation often require smaller coverage areas with a limited number of endpoints positioned close to each other. Mesh topology is also a viable solution to extend the footprint of legacy Wi-Fi networks – available in literally every single house nowadays – without exploding costs or involving sophisticated network management. High bandwidth usage in many consumers applications like video calls and streaming, voice control, etc. further makes Wi-Fi mesh most feasible if you’re looking for one integrated home network. On the other hand, if you want to connect hundreds or thousands of sensors distributed over geographically dispersed campuses and facilities like factories, mines, oilfields or commercial buildings, LPWAN using star topology is the better choice. It provides a reliable, cost-effective and easy to deploy and manage solution. Configuring and optimizing mesh networks, on the contrary, can be an extremely daunting task in this case. Still wondering which combination of network topology and communication technology best suits your needs? Visit our blog on 6 Leading Types of IoT Wireless Tech and Their Best Use Cases.